Phibase has been publishing weekly free technical trade analysis since Jan 2019 on the ForexSignalPort site. We look forward to posting the trading recommendations on this thread [under Manual Systems/Trade Journal] to benefit from the collective knowledge of traders and experts on this forum. GOLD price action was consolidating between 1295 to 1275 over past few weeks and has seen a break out of the range on Friday powered by USD weakness. The price is inside the Potential Reversal Zone for considering short positions - however, The strong bullish bar seen on Friday is likely to take the price towards the upper resistance levels near 1309 (238% fib ext of BC leg) or even 1319 (262% fib ext of BC leg). Based on the above, we have altered our D point (PZR) to 1309 to 1319. Phibase team has pre-programmed scripts to trade GOLD on reversal confirmation in the PZR - Members with ForexSignalPort trade cloner EA will trade this set up automatically. Trade will be executed in price range of 1315 to 1319, with Stoploss level just above 1325 (High of May 2018). We will not trade short size below 1315 since the SL would be beyond 100/120 pips - which is the maximum limit we have set for all our trading strategies. The reward offered by Short is also seen to be limited due to support expected at 1298/1293 levels. We aim for trades offering Risk/Reward closer to 1:3 for trade execution. Manual traders can consider short entry levels above 1309 on resistance confirmation. US Shutdown/Emergency related developments may provide long opportunities from resistance turned support zone at 1298 to 1293 levels. Gold could potentially see upside moves to 1365 (High of 2018) - this could provide Long trades with very good risk : reward. Our team will factor in USD weakness/strength and developments in the US political space for the long position upon re-tracement of price to 129x levels. 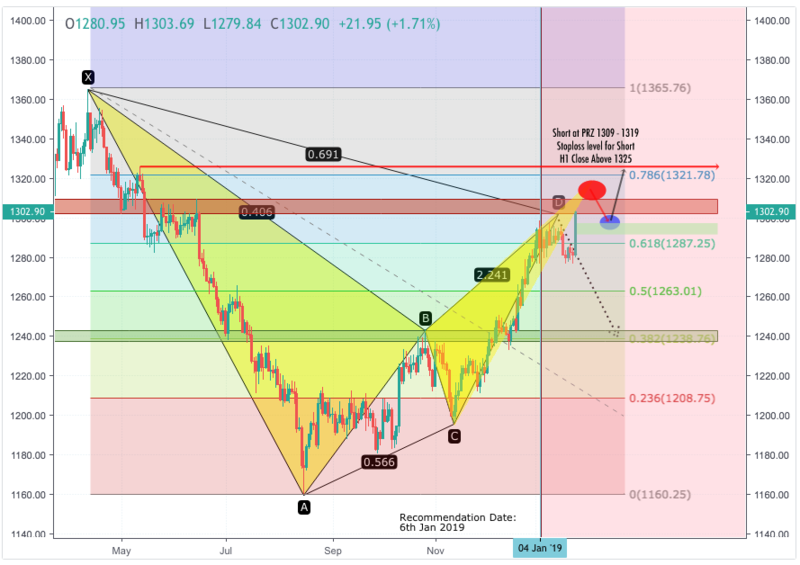 SHORT set up valid if price reaches 1309 to 1319 level this week (Last week of Jan 2019). Break above 1325 will invalidate the trade setup and recommendation. LONG Set up valid if price retraces to 1298 to 1293 level (after reaching PZR) within next two weeks. Break below 1289 will invalidate the long trade recommendation. Allow room for reaching higher gains or book gains + re-enter LONGs on pull backs. Pound has moved into bullish region for the first time in nearly a year as the markets perceive any Brexit news other than no deal is seen positively. Second referendum, extending Article 50 or no deal still lingers with EU27 taking a stand and UK Parliament voices getting murky.The pound has been gaining on any deal or delay in Brexit - risk of no deal was receding has been supportive. The uncertainity may continue through this week and Phibase team has setup an automated script to buy into retracement dips (Not sharp news based moves). 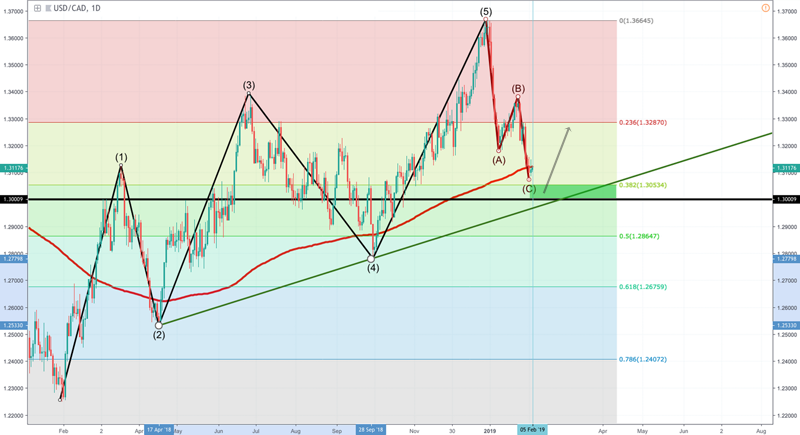 USDCAD (D1) price action had completed the impulse 5-wave pattern and entered corrective 3-wave pattern in Jan 2019. The corrective wave C touched the 38.2 of Aug 2017 low to Dec 2018 high and has bounced a bit. 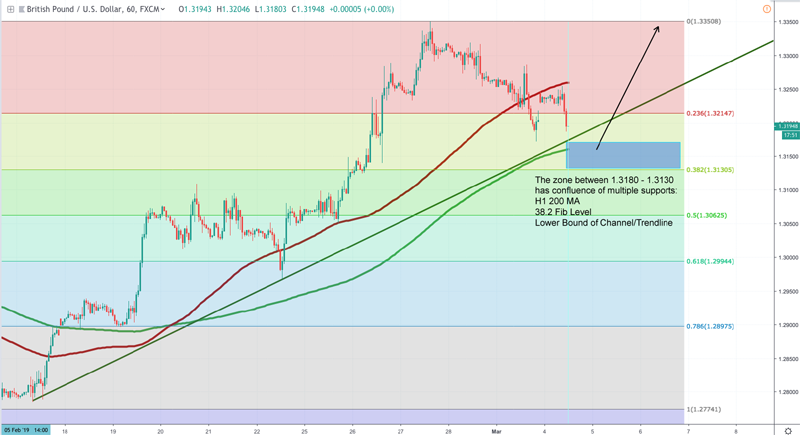 Phibase team expects wave C to extend down to the 38.2 fib level again and may test the earlier resistance turned support level at 1.3000 and the trend line support seen from lows of waves 2 and 4. The Potential Reversal Zone (PZR) is defined at 1.3050 to 1.3000 - News based break below/consistent H1 closes below 1.3000 would invalidate this recommendation. USDCAD could offer opportunity for LONG trade with good risk:reward 1:3 (SL -100 pips : TP 250 pips). Phibase team has setup an automated script to Sell at 38.2/H1 200 MA and buy USDCAD when reversals is confirmed in the PZR. 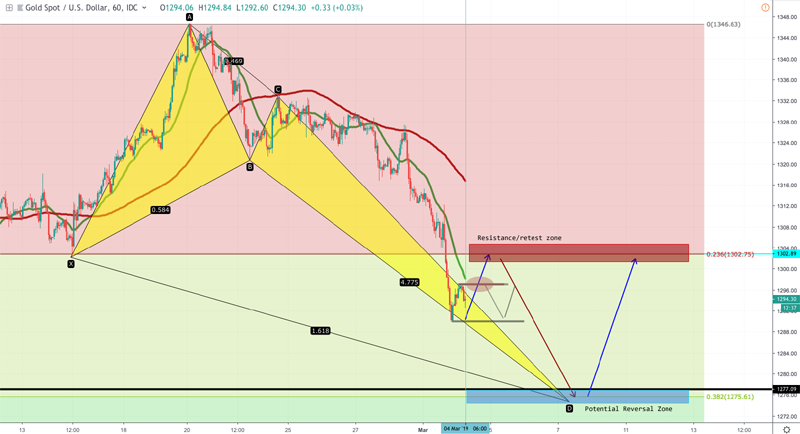 The setup will be executed in lower timeframe (H1). These look like they can add some good value to the signal port signal. If they can keep up like htis. 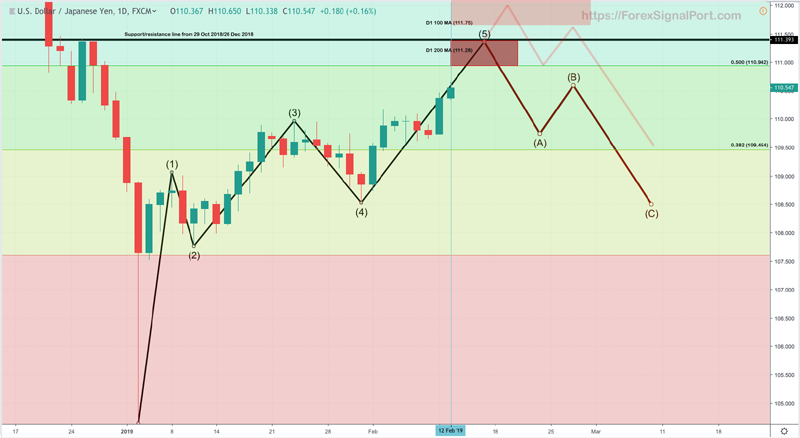 USDJPY has staged a 5 wave recovery from its low seen on 3rd Jan 2019. The potential to reach the resistance zone 111.00 to 111.40 may be seen if US and China talks conclude with a positive note. USDJPY has also been moving up as the Yen has been weakening over past few weeks. Potential Reversal Zone (PRZ) is seen as 111.00 to 111.40. We expect Yen to start strengthen again and USDJPY could see the start of corrective wave A from the PRZ. Phibase team has setup an automated script to short trades in the PRZ zone which offers good risk reward of 1:3 (75 pips : 225 pips). 100 Day MA at 111.75 provides final resistance level to place stoploss above for the short. We will also look to buy into retracement dips to 110.00 levels with very tight stoploss below 109.85 (if the dip is seen prior to 111.00 being achieved). Thanks, does it support MT5 tests, want it to try on my Hotforex platform. ForexSignalPort is an MT4 EA to clone trades of the managed portfolio consisting of Phibase EAs - FSP EA does not contain any strategy hence cannot be backtested. All Phibase EA's [INDEX, RAYBOT, iPROFIT and CABEX] run on MT4 and can be backtested individually - The FSP subscription license does not include standalone EAs and can only be used for live trading. 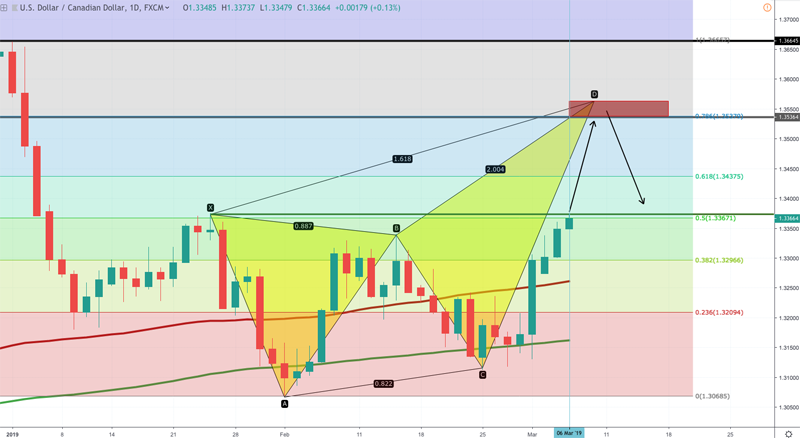 GBPUSD Bullish Gartley seen on H4 timeframe with D1 100 MA coinciding with PRZ. Brexit news could lift Pound, but lack of clarity during this week is seen as risk for Long trades. Phibase team expects GBP to do better against Yen due to USD Strength which may limit GBPUSD moves. INDEX EA is short on GBPJPY. The manual long trade could provide good hedge to the INDEX short trade. Conditional trade entries on GBPJPY will be setup based on reversal at PZR on GBPUSD chart. This trade setup was executed using three trades to reduce risk (total +409 pips). 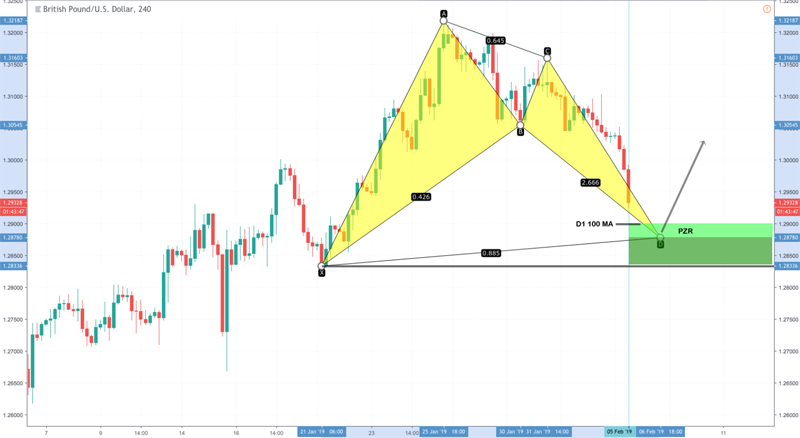 Update 12 Feb 2019 : GBPJPY LONG : Executed @ 142.00. Closed for +29 pips. Update 14 Feb 2019 : GBPUSD LONG : Executed @ 1.2830. Closed for +59 pips. Update 19 Feb 2019 : GBPUSD LONG : Executed @ 1.2902. Closed for +138 pips. Update 26 Feb 2019 : GBPJPY LONG : Executed @ 145.93. Closed for -24 pips. 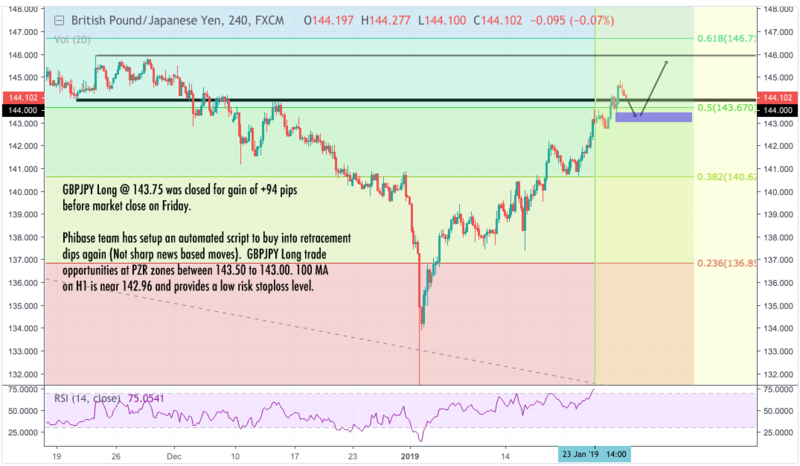 Update 26 Feb 2019 : GBPJPY LONG : Executed @ 145.84. Closed for +185 pips. Update 26 Feb 2019 : GBPUSD LONG : Executed @ 1.3187. Closed for +112 pips. XAUUSD had reached a high of 1345 in February and has been falling down to its weekly support levels. The levels between 1302 and 1275 provide good trading opportunity with several technical levels and a Crab Pattern reversal D point in agreement at 1275 levels - this could be a good area to go long. We will also look for short opportunities between 1298 to 1304. GOLD will remain bearish below 1315 (current 100 MA) and we will look for short trades before the PZR level of 1275 is reached. Phibase team has setup an automated script to short trades in the Resistance/Retest zone and Long trade from the PRZ zone which offers good risk reward of 1:2.5 (100 pips : 250 pips). 100 Day MA at 1265 provides final support to place stoploss below for the long at PZR. We will also look to short into retest of 1300 levels with very tight stoploss above H1 20 MA/recent highs. Phibase team has setup an automated script to short trades in the Resistance/Retest zone and Long trade from the PRZ zone which offers good risk reward of 1:2.5 (100 pips : 250 pips). 100 Day MA at 1365 provides final support to place stoploss above for the long at PZR. We will also look to short into retest of 1300 levels with very tight stoploss above H1 20 MA/recent highs. Members with ForexSignalPort trade cloner EA will trade this set up automatically. If you wish to trade this setup manually, we request you to follow strict risk management and stoploss rules. GBPUSD may find support between 1.3180 to 1.3130 due to a confluence of technical levels. Brexit optimism had earlier lifted GBPUSD to 1.3340 levels after which profit taking has given a good retracement. We are biased towards being long on GBP due to decreased chances of No-Deal/Hard Brexit. Brexit delay (atleast till June) or some deal looks most likely now - UK voting next week may again take GBP higher. Phibase team has setup an automated script to long trades in the support zone which offers good risk reward of 1:2 (100 pips : 200 pips). The level 1.3100 provides a stoploss level for the long at PZR. INDEX GBPJPY SHORT is currently open and the Tech Trade GBPJPY is being used to hedge the short position which is gaining currently. High risk of headlines/rumors may trigger very sharp reversals overnight/during low volume hours. The Long trade's SL has been addjusted to 180 pips to ensure it remains open until the INDEX short is closed. Max risk of of the hedged trades would not exceed -60 pips. We expect Short to close with gains and the long will be closed prior to weekend close. Update : 8th March : INDEX GBPJPY SHORT closed for gain of about +135 pips. Tech_Trade Long which hedged the short trade was closed at -150 pips since the GBP long trade setup was invalidated on GBPUSD's break of 1.3100 level. Phibase team has setup an automated script to long trades on break of the double top or at reversal from bottom trend-line of the H1 upward sloping channel. Short trade from the PRZ zone offers good risk reward of 1:3 (50 pips : 150 pips). USDCAD BUY Trade Executed at 1.3377 and closes at 1.3445 (+68 pips). Will re-enter long on successful retest of breakout level.